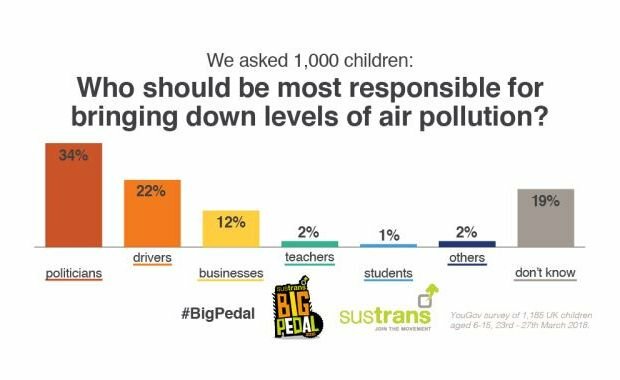 A YouGov poll, carried out for campaigners Sustrans, asked more than 1,000 children aged six to 15 about air pollution and the actions they think should be taken to help clean up the air. More than one in three (34%) think politicians are most responsible for bringing down levels of air pollution, while over a quarter (29%) believe drivers are. A similar number (38%) of those surveyed think encouraging more people to cycle, scoot or walk to school is the best way to help to reduce levels of air pollution, while a further 16% feel that reducing the number of journeys taken by car would play the greatest role. Sustrans CEO Xavier Brice, said: ‘We’re in the midst of an air quality crisis. This survey demonstrates for the first time that children are aware and concerned about poor air quality. We wanted to hear their views on the matter, as they are some of the most susceptible to the adverse effects of air pollution, which can lead to poor lung and brain development and asthma if exposed for long periods of time at a young age. The survey has been released to launch the Big Pedal 2018 (23 April – 4 May), the UK’s largest schools competition to encourage more young people to cycle, walk and scoot to school. The number of children concerned about air pollution rose to over half (53%) in London. 34% said having a shorter distance to travel would most encourage them to walk, cycle or scoot to school, followed by fewer cars on the road (12%) and separated from traffic cycling routes (11%). More than half (57%) of the children surveyed said they were told about air pollution by their school.